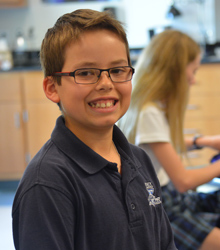 Trinity students explore information, make meaningful connections, and solve problems both collaboratively and independently. We prioritize academics, but we also celebrate successes and perseverance because we believe children learn best through active learning and positive reinforcement. Students learn about atmospheric perspective, color blending, narrative, and the science behind the Northern Lights. There are many ways to solve a problem or express an idea, and Trinity celebrates that. Perhaps the most obvious example is art class. Lower school art teacher Meg Renwick encourages her students to build on the techniques and concepts of the lesson, make the idea their own, and venture in unexpected directions. "Kids love seeing that they are capable of making beautiful, complex works of art," Ms. Renwick said. "They love trying new materials and figuring out how to make something that either matches what’s in their mind’s eye or becomes something completely new and different." As a natural wonder, Aurora Borealis makes for a fun and beautiful art project. But it's also an opportunity to weave science and art together. 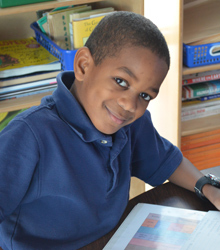 Trinity's curriculum strategically integrates subject areas to make the learning experience more holistic. "I learned that the Northern Lights don't go very fast, so you have time to really see how beautiful it is," said Melania M., a 2nd-grader at Trinity. Before joining Trinity 13 years ago, Ms. Renwick taught informal classes for adults at Austin Community College and the University of Texas at Austin. She realized she preferred teaching children because they have fewer preconceived notions about what they should create. She said she's grateful for the creative journies she shares with her students. "Every day, I am thoroughly impressed by the risks kids are willing to take, their fresh ideas, and overall passion for art," Ms. Renwick said. "The students are learning, but so am I!" 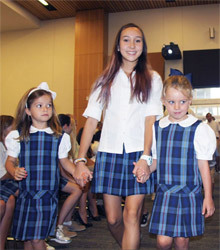 Find out more about our fine arts programs at austintrinity.org/arts. Students explore their classroom to find three-dimensional shapes, sort them, and explain their mathematical thinking. A hands-on activity like this scavenger hunt is a great instructional tool. Sure, it keeps kids engaged in the learning process and burns a little energy, but it has an added benefit. With students going at their own pace, the teacher can meet each child where they are in terms of their comprehension level at that given moment. 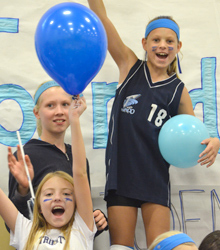 The activity also facilitates student-led learning. "Some of my favorite teaching moments are when students are talking through a possible solution and then a light bulb goes off halfway through their explanation," said Lindsay Clark, a lower school lead teacher at Trinity. "They either figured out a more efficient way of solving the problem, or they discovered an error and can now make the correction." This lesson introduced three-dimensional shapes and built on knowledge from the previous unit of two-dimensional shapes. Students identified, described and compared shapes like cubes, rectangular and triangular prisms, pyramids, cylinders, cones and spheres. Their goal was to apply the concepts being presented by exploring the classroom environment for 3-D shapes and sorting them according to defining attributes. Then they had to explain their mathematical thinking. Ms. Clark said the last step is the most crucial and most rewarding part of the process, both for her students and her. "When students not only have to come up with a solution but also have to justify and prove their answer—that's when I notice all of the pieces fall into place," Ms. Clark said. 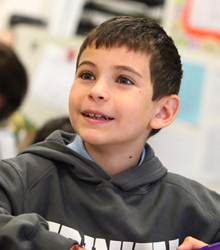 "The discussion gives them a chance to revise and grow their thinking. There's always more than one way to solve a problem, so sharing strategies or listening to each other’s ideas helps all of our mathematical repertoires to grow." 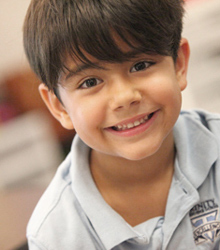 Learn more about our math curriculum at austintrinity.org/coursework. Students restore a hiking trail and, in the process, learn about soil erosion and invasive plants. On our tours, you'll see plenty of examples of active, engaged learning taking place in our classrooms. But we believe learning shouldn't be confined to a classroom! Our curriculum includes outdoor opportunities like gardening and habitat restoration right here on our 21-acre campus. "We look to restore native spaces to create a healthy and diverse wildlife community," said Bill Earley, who teaches science and social studies at Trinity. "We're addressing our community space and working to create an environment where wildlife can coexist with us." This trail restoration project is designed to increase students' awareness and appreciation of their natural environment and to instill a higher level of work ethic and stewardship. Students discuss urban sprawl and development, habitat fragmentation, and loss of natural resources. They also analyze population data to determine if the project has had a positive effect, both for individual species and the wildlife community as a whole. Then students use their knowledge to educate others by building presentations and leading parents on tours. "In social studies, students develop ways of thinking drawn from many academic disciplines," Earley said. "They learn how to analyze their own and others’ opinions and ideas on important issues and hopefully become motivated to participate in their communities as active and informed citizens." Check out more opportunities beyond the classroom at austintrinity.org/beyond. Students practice strategies like 4-Part Array and the Standard Algorithm to solve double-digit multiplication problems.